New Russia gubernia (Новоросійська ґуберня, Novorosiiska gubernia; Russian: Новороссийская губерня, Novorossiiskaia guberniia). The administrative-territorial designation from 1764 for the region in Southern Ukraine annexed by the Russian Empire from the Zaporozhian Cossacks, the Hetman state, the Crimean Khanate, and the Ottoman Empire. The gubernia encompassed the frontier territories of New Serbia, Slobidskyi Regiment, Sloviano-Serbia, the Ukrainian Line, and 39 companies of the abolished Hetman office's Poltava regiment, Myrhorod regiment, Lubny regiment, and Pereiaslav regiment. From 1765 the gubernial center was Kremenchuk. The gubernia was governed according to the Russian Senate's ‘Plan for the Colonization of New Russia Gubernia,’ and the military colonists and Cossacks there were transformed against their will into regular hussar and lancer regiments. The gubernia was divided into the Elizabethan province, with five regiments west of the Dnieper River, and the Catherinian province and Bakhmut county, with four regiments east of the Dnieper. It was the first region in the Russian Empire in which Catherine II allowed foreign Jews to settle. The gubernia bordered on the Zaporizhia, the ‘free lands’ of the Zaporozhian Cossacks, who opposed tsarist encroachments onto their lands and repeatedly attacked and destroyed new settlements. Consequently the gubernia's administration had a semimilitary character. It was governed consecutively by the ‘supreme commanders’ Aleksei Melgunov, J. von Brandt, M. Leontev, F. Voeikov, and, from 1774, Grigorii Potemkin. The regimental commanders under them had both military and civil authority. Each settler in the gubernia received a subsidy and 26–30 desiatins of land. Those who also enlisted in the cavalry regiments received larger subsidies and did not have to pay taxes. Any military officer (including a member of the Cossack starshyna) who settled in the gubernia received noble status and a rank estate. Nobles and recruiting agents could establish and own a hereditary free village (sloboda) of no more than 48 households and recruit settlers, usually from among Ukrainian peasants who had fled Polish and Russian serfdom, but also from among Russian Old Believers and state peasants. If the village owner did not populate his land within three years, he forfeited it. Foreigners (mostly Moldavians and Wallachians, but also Germans, Serbs, Bulgarians, Armenians, Georgians, and Greeks) received the largest subsidies; those who brought 300 colonists with them received the rank of major, those who brought 150 became captains, and those who brought 30 became sergeant majors. In the northern part of the Catherinian province much of the land was already owned by the wealthy Cossack starshyna. Because most of the peasants there were enserfed, several thousand fled to the free villages and to the lands of the Zaporozhian Cossacks. In the gubernia's towns Greeks and Old Believers controlled commerce. Unlike elsewhere in the Russian Empire merchants (65.1 percent Russian, 24.5 percent Ukrainian, and 10.4 percent foreign in the 1770s), not landed gentry, owned the factories. During the Russian-Turkish War of 1768–74 the gubernia's inhabitants bore the brunt of maintaining the Russian forces. In 1769–70 the gubernia's Donets, Dnieper, and Luhan lancer regiments rebelled against tsarist rule and were brutally repressed. Also in 1769, Crimean Tatars invaded the Elizabethan province, destroyed over 50 villages, and took away the inhabitants and cattle. In 1774 the gubernia absorbed new lands annexed from Turkey between the Dnieper River and the Boh River and along the Black Sea littoral. In 1775 the free lands of the Zaporizhia were confiscated and divided between New Russia gubernia and the newly created Azov gubernia, and in 1776 Bakhmut county and the Catherinian province were transferred to Azov gubernia. 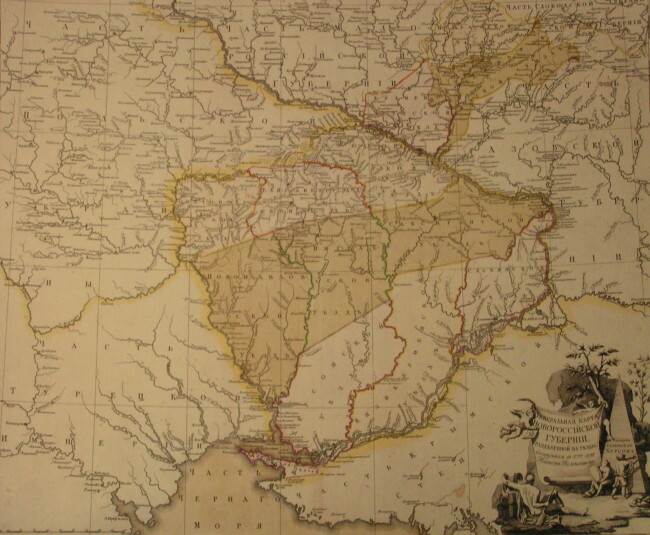 Thereafter New Russia gubernia consisted of Kremenchuk county and the provinces of Yelysavethrad (3 counties), Poltava (2 counties), Sloviansk (renamed Nikopol in 1781; 3 counties), and Kherson (3 counties). After the Russian annexation of the Crimea in 1783, New Russia gubernia and Azov gubernia were replaced by Katerynoslav vicegerency. In 1791 the vicegerency absorbed lands annexed from Turkey between the Boh River and the Dnister River. In 1797 most of the vicegerency's territory became part of a new New Russia gubernia, with its capital in Novorossiisk (Katerynoslav). In 1802 the gubernia's lands were divided among the new Mykolaiv gubernia (from 1803, Kherson gubernia), Katerynoslav gubernia, and Tavriia gubernia.